In nature, very small communities of microorganisms exist in very large numbers. Given those large numbers, they mediate key biogeochemical and ecological processes on a global scale. Microbial biogeochemical cycling in terrestrial and aquatic ecosystems, for instance, shapes Earth's climate. From Earth's deep history, there is also a dramatic example of how tiny microbes can have big influences. During the "Great Oxygenation Event" 2.3 billion years ago microbial photosynthesis introduced O2 into the atmosphere. Because microbial communities are so consequential, it is important for scientists to understand the effect microbes have on each other. And to understand the genome-encoded mechanisms by which microbes exchange resources, including carbon, organic nitrogen, and vitamins. Yet the interspecies mechanisms by which microbes interact in functionally diverse communities remain poorly understood. A new paper from researchers at the Pacific Northwest National Laboratory (PNNL) and at Pennsylvania State University demonstrates a model consortium made of two species used to infer and test specific interspecies interactions during changing environmental constraints and growth kinetics. In nature, community-level microbial responses are a function of all the species present, even those in low abundance. But natural communities are structurally and functionally complex. Their interactions are too entangled for researchers to observe the behavior of specific microbial species. Hence the need to infer general principles of interspecies microbial interaction by observing a model consortium grown in controlled laboratory environments. The new study, directed by PNNL lead author Hans Bernstein, describes how microbial partnerships lead to the expression of genes that encode for the synthesis and exchange of resources. This gene expression is relevant to almost all food-webs and biogeochemical cycles. Some of the observed behaviors in this novel model relate to the most foundational functions of life, such as carbon and energy acquisition. They suggest putative principles in metabolic coupling between photoautotrophic primary producers and the heterotrophs that depend on them for sustenance. The paper's chief result is evidence of indirect interspecies regulation. To assemble the model consortium researchers employed two well-annotated microorganisms isolated from geothermal hot springs. 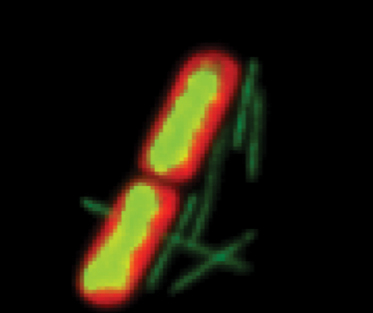 Thermosynechococcus elongatus BP-1 is a phototrophic cyanobacterium and primary producer. Its partner in the model was Meiothermus ruber strain A, an aerobic heterotroph that depends on the cyanobacterium for organic carbon, oxygen, reduced nitrogen and essential co-factors (vitamins). The researchers were able to couple global transcriptomic measurements to the environmental factors used to control the consortium's growth and energy acquisition rates. They compared the results obtained from this binary consortium to a cyanobacterial monoculture control. That comparison allowed the researchers to determine which transcriptional and physiological responses were caused by interspecies partnership over a dynamic range of light and oxygen conditions. The results revealed mechanisms that enable both interspecies metabolic coupling and acclimation to partnership. The mechanisms support the hypothesis that gene expression (with its resulting changes in microbial physiology) is indirectly regulated by distinct partnerships between species. The observed heterotrophic partnership between a producer and a consumer, among other things, increased the efficiency of biomass production (a measure of growth per unit of energy acquired) and improved resistance to oxidative stress (from high levels of dissolved oxygen). Moreover, both species underwent physiological changes induced by their partnership. The authors used these to infer specific interactions prompted by synthesis and the interspecies exchange of resources. For one, the cyanobacterium responded to heterotrophic partnership by altering the expression of core metabolic genes linked to photosynthesis, carbon uptake and fixation, vitamin synthesis, and the scavenging of reactive oxygen species. The study sheds light on how a cyanobacterial primary producer acclimates to a heterotrophic partnership by modulating the expression of key metabolic genes. In addition, it shows that heterotrophic bacteria can indirectly regulate the physiology of photoautotrophic partners. What's next? The functions described could represent generalizable principles of phototroph-heterotroph interactions, which are ubiquitous in globally consequential natural microbial communities. Sponsors: This research was supported by the U.S. Department of Energy Office of Biological and Environmental Research (BER) Genomic Science Program and is a contribution of the Fundamental Scientific Focus Area. Research team: Hans C. Bernstein, Ryan S. McClure, Natalie C. Sadler, Young-Mo Kim, William B. Chrisler, Eric A. Hill, Margaret F. Romine, Janet K. Jansson, Jim K. Fredrickson, Alexander S. Beliaev (PNNL). Vera Thiel and Donald A. Bryant (Pennsylvania State University). A new paper demonstrates a model consortium made of two species used to infer and test specific interspecies interactions during changing environmental constraints and growth kinetics.